Gone are the days when loyalty programs were used to just attract customers; these days, they are more of a use for customer engagement and user experience enhancement. Our intention is to turn passive observers into active shoppers and that is why we have come up with gamification tool. The USP of this eCommerce gamification extension for Magento is, ‘it helps you get repeat customers’. Most of the eCommerce merchants face difficulty in converting visitors into customers. Well, this Magento eCommerce gamification extension helps you solve this problem and increase your conversion rate. If customers want to buy a product at specific price, they can either select price from the list or select ‘custom value’ to enter their desired price. Customers can grab these offers that pop ups show on product page. You can avail the discount within specific amount of time without using coupon. The gamification tool keeps a track on customers’ browsing pattern and brings them the offers based on that, directly into their mail box. Customers can also avail discount by using the coupon code that is displayed on the windows which pops out while they are browsing through particular product. Customers can also avail discount by using the coupon code that is displayed on the windows which pops out while they are browsing through particular product category. ‘Knowing your customers, understanding their needs and requirements and fulfilling their expectations’ is the roadmap to success for any and every business. Surveys can help you the best in understanding the needs and wants of your customers. So, taking surveys, combining data, analyzing it and then making informed decision is the best way to do business. However, most people are too lazy to fill up surveys in paper, as a result of which we came up with this Survey extension. 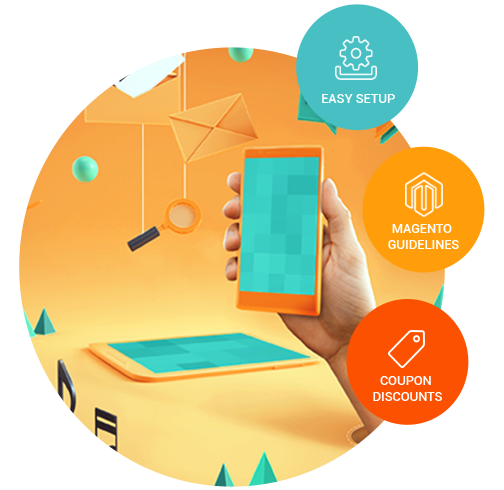 This easy to use Magento eCommerce gamification extension will be fun for customers, so no one will refrain from filling it up. It helps you get answers of the same questions from different customers in the same structured format. Customers can answer all the questions listed on single page and then click on submit. Customers have to answer a question on each page and click on ‘Next’ after answering every question till the last one after which they can click on ‘Submit’. Customers get coupon code for discount once they submit form.